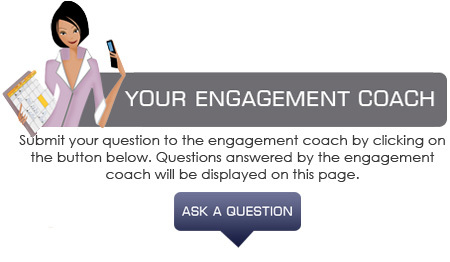 The Engagement Coach Q&A section is an open forum where guys can share questions with the Engagement Coach and with other guys. If you want private one-on-one advice, go here. Q: My boyfriend of almost 3 and 1/2 years and I want to move in together next year but how can I be sure he will propose? A: You need to have that talk before you move in with him. Say something like you love him and think that living together is something you want to do as you think he is your soul-mate and that you will marry him and have his children. You just want to make sure you are both on the same page. That of course if somehow working together does not work out it’s life but that if it works out your hopes are to get engaged within the next 2 years. Are you and him on the same page? Q : I have been with my 2 boys father for 7 years in october. We live together and he still hasn’t popped the question. What do you think about it? I love him and want to spend the rest of my life with him and I know he loves me too. But when will he ever pop the question ?! I e-mailed him about a week ago saying I wanted to get married by the end of the year. I know he got the e-mail but he’s avoiding the sitauation all together. So what should I think? A : I think this needs to be addressed in a conversation not by email! You need to sit down with him and talk it out. Q: Are there any custom engagement ring designers that can create an unique setting for me? When my boyfriend proposes (it’s coming soon! ), he has said that it will just be a diamond solitaire to begin with; the setting will be chosen later. This way the focus of the budget goes towards the diamond itself. The problem I’m having, is that I’m not one for a traditional setting; I like a ring that looks unique. I found one or two places, but they are both out of state (I’m in southern CA). Is there another way to create my setting that I’m not thinking of? A: Any local jeweler can help your fiance customize a ring. Larger chains and department stores don’t do it. However any independent jeweler can help you create a unique piece. Where are you located? Question: So my boyfriend was kinda questioning when the last time aunt sally came to town (if you know what I mean) and then he said oh ok. I said: “Why do you ask?” He said “because it wouldn’t be the end of the world, having a baby with you.” That’s exactly how he wrote it. We have been together a year at the end of April but shouldn’t he be proposing to me first and thinking about getting married to me and popping the question before he thinks about a baby? What do you think? Answer: I think that it’s a really good sign he wants to have a baby with you. Before getting into weddings and engagements, you should keep on talking with him about family plans. Share with each other how you both envision your future. Then things should fall naturally into place and you can tell him that marriage is important for you. Q: So what does everyone thinks about a 3 year plan? The first year you date, the second year you get engaged and move in together and the third year you get married. Is that average or logical? Too long? Too short? A: There is absolutely no rule. Each couple has a different story. Is it politically correct for the woman to propose to a man, if so, should she give him an engagement ring? The Rules of Engagement are starting to evolve as you can see in this week’s piece by Michael O’Connor. If you feel that you want to propose, why not? However it’s not for every couple. If you feel that you are both equal in this relationship and that this move won’t hurt his pride as a male, go for it. If you are worried about his ego, I think you should be more subtle and start addressing your future and a possible wedding. If he is ready, he should make the engagement move. If he is not, you should not force it and decide if you are ready to wait. I don’t feel ready to get engaged so soon and the ring he got me is not the one for me. How can I tell him? Question: So my boyfriend and I have been together for going on 11 months and have lived together the past 8 months. We’ve talked about marriage and I told him that I wanted to wait till 2 years passed with him before there would be an engagement. He took it as I just do not want to marry him but it’s more of just being sure that he is the one I will spend the rest of my life with. After this conversation that we’ve had time and time again on Black Friday he went and bought me a ring anyways and planned to ask me this Christmas. I don’t know how to approach him on two things; one being that I still want to wait and two that the ring he has gotten though it is beautiful I feel like its not the ring for me. It honestly looks like a ring style I can find in claires’. I always envisioned a ring that was more unique and I don’t know how to approach the situation where it won’t end in a fuss. Suggestions? First and foremost, it’s not going to be easy but you are forced now to re-evaluate your relationship. Though getting proposed to so fast is, flattering, the fact that your BF did not hear you out is an issue. The fact that he also did not try to get you a ring you’d like, too. Communication and respect of each other’s needs are important in a relationship. You need to have a talk with him about that. No need to make it too serious, laugh about it but still, you are your own woman and deserve to be heard. After that, if you both agree to wait, you should trade the ring for a promise ring you both like. If the ring is worth too much money, return it for now. How can I be sure I have picked the ring of my dreams? Question: How can I be sure I have picked the ring of my dreams? I really have no idea what type of ring I would want to wear everyday for the rest of my life. Do you have any advice or tips that can help me decide whats exactly right for me? Answer: We have an awesome article that’s coming out in our December issue about that. It seems that for you, practicality and lifestyle should be what you have to consider. Are you outdoorsy? Do you perform lots of household chores? What kind of jobs do you and your boyfriend have? Do you go to a lot of formal events? According to that you can decide about the setting from simple to intricate you should pick. Try on some rings at a jewelry store and see what you like in terms of center stone and what feels right on your finger. Are there any setting for a stone with an unusual shape that doesn’t have to be completely custom made? Question: I have a 10mm trillion cut gemstone that I want set for the center of my engagement ring. It has been horrible trying to find a setting that doesn’t have to be completely custom made. Are there any jewelers that have such a setting available? Modification is fine but custom is not the desire at this time. Answer:Unfortunately , when you have a stone with an unusual shape, the setting needs to be custom-made . You don’t want to lose the stone. Another solution would be to set it as a pendant, that would be easier. Designing your own ring can be a fun experience . You are creating a new family heirloom that will be passed on from generation to generation. It could be worth the effort.